With $163 billion agreed in new upstream deals in 2017, Evaluate Energy’s latest report suggests that the recently improving oil price will encourage continued M&A spending around the world in 2018. “Heading into 2018, the oil industry finds itself in a far healthier position than at this point two years ago, when the oil price was sub-$40 and OPEC remained firm in its stance to let the free market dictate the oil price,” said Eoin Coyne, lead author of the new report in his role as Senior M&A Analyst at Evaluate Energy. “Since this time, there has been significant progress from industry in pushing down production costs, while the companies that survived have more stable balance sheets. With OPEC’s production cut extending to the end of 2018, we expect the oil price to have a supporting floor of $50 in the coming year,” added Coyne. Oil companies at large have always used the current trading price of oil as the best barometer of how expansive to be in their investments. If the oil price behaves as expected, we can expect the 2018 total spend to match or improve upon the $163 billion reached in 2017. The Evaluate Energy report also provides insight on the companies that are best positioned to take advantage of deal opportunities in the coming year by looking at some key debt ratios. More information on the companies with the greatest ability to assume more debt, according to Evaluate Energy calculations, is available in the report, which can be downloaded here. There are 100s of upstream and downstream oil and gas companies based in the United States varying from large international players such as ExxonMobil and Chevron Corp., right down to small, single-play, domestic focused companies. The Evaluate Energy database provides coverage of every single publicly listed U.S. upstream and downstream oil and gas company, providing clients with all their production data, key financial performance metrics, M&A deals and much more. Request a demo of Evaluate Energy at this link. Click here to access our library of free, downloadable oil and gas reports. Contango Oil & Gas Co.
Energy XXI Gulf Coast Inc. Extraction Oil & Gas Inc.
Spindletop Oil & Gas Co.
Brazil secured an encouraging US$3 billion in bonus bids during key licensing rounds held last fall, according to a new report, which represents 23% of the country’s total upstream deal values since 2014. This fresh investment, notably in offshore pre-salt basins, follows the introduction of significant regulatory changes to the oil and gas sector within Brazil. The report, entitled Latin America: Assessing The Impact Of Oil Prices, Energy Reforms And National Oil Companies On Deal Activity, is produced by the Daily Oil Bulletin, Evaluate Energy and Sproule. It assesses the impacts on deal-flow and itemizes the bonus bids made by several global oil and gas powerhouses. It also highlights the key upstream deals within the other US$9.9 billion in upstream deals agreed in Brazil between 2014-2017. With a total of US$12.9 billion, Brazil witnessed more M&A activity in terms of pure deal values than any other Latin American nation. Source: Latin America: Assessing The Impact Of Oil Prices, Energy Reforms And National Oil Companies On Deal Activity. The full report, which includes analysis of M&A trends in Brazil, Mexico, Argentina and Colombia, is available for download here. Follow Sproule on LinkedIn for the latest updates. In a relatively stable year for the oil and gas industry, overall M&A spend – based on deals announced – in the upstream sector reached $163 billion during 2017, according to a new report released today by Evaluate Energy. The full report is available for download here and provides insight and analysis on all the key deals of the year around the world. This total of $163 billion in new upstream sector deals is 17% higher than the $139 billion reached during 2016 and is also the highest annual outlay since 2014, the year the oil price first dropped in this current cycle. Deal counts were also up, year-over-year. 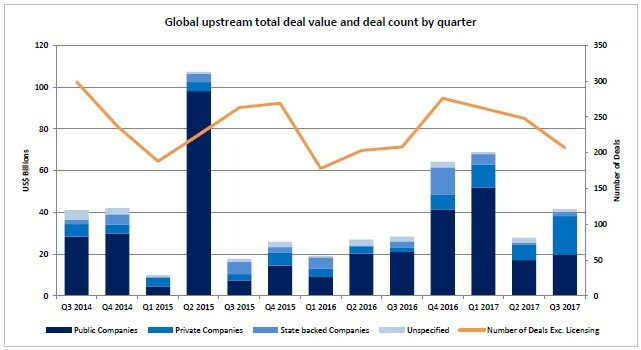 “Upstream deal values were high in 2017 compared to recent years, but the data also shows a real increase in underlying activity this year. The number of what we refer to as ‘significant’ deals – those with a value of over $10 million – was up by 10% from 2016,” said Eoin Coyne, lead author of the new report in his role as Senior M&A Analyst at Evaluate Energy. The oil price has been the key driver behind this increased activity in what has been the strongest year for the average price since 2014. In 2017, the WTI price averaged $50.80, which is 17% higher than the 2016 average of $43.29. For more on all the key deal trends in the upstream sector in 2017, download the full report here. The report includes detailed overviews of the largest deals in North America, Europe and Latin America. 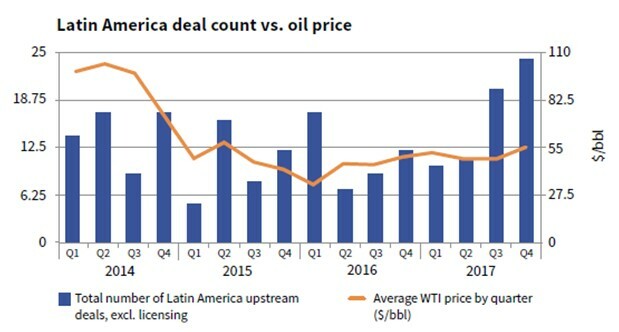 Upstream M&A activity in Latin America has been able to largely withstand falling oil prices that stalled deal flow in many regions of the world, with deal counts largely unaffected. That is one of the key findings of a new report on Latin America released this week by the Daily Oil Bulletin, Evaluate Energy and Sproule. The report, entitled Latin America: Assessing The Impact Of Oil Prices, Energy Reforms And National Oil Companies On Deal Activity, includes analysis of Brazil, Mexico, Argentina and Colombia. It is available for download here. Latin America is one of the world’s fastest growing upstream environments. With major producing countries in the region racing to attract investment, the deal counts illustrate that even in the toughest of investment environments there is a willingness to deal. 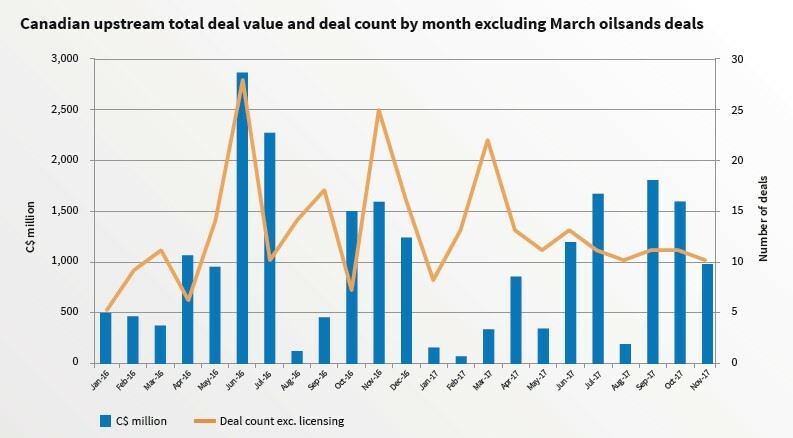 Canada saw less than C$1 billion in new upstream M&A activity for the first time in three months according to the latest M&A review from CanOils. November’s total of C$976 million represents a significant fall of 46 per cent and 39 per cent, respectively, from totals witnessed in September and October. The single largest deal in November was another asset sale by Cenovus Energy. The company agreed to sell its Weyburn unit in Saskatchewan to Whitecap Resources, in so doing reaching a major debt milestone related to its C$17.7 billion acquisition from ConocoPhillips. This month also saw Pengrowth Energy continue its asset sales program in Alberta, completing a C$150 million deal in Swan Hills and agreeing another minor deal in Quirk Creek. The company will focus its efforts on two assets going forward – thermal oil production at Lindbergh and Montney gas at Groundbirch. November saw almost 28,000 boe/d put up for sale in new public asset listings. Full analysis on all deals and asset listings in November are available in the CanOils report, which can be downloaded here. 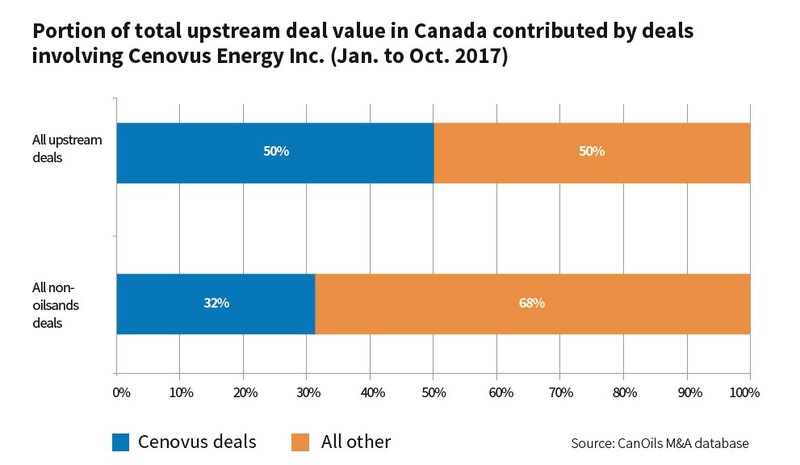 According to new data in CanOils’ latest M&A review for October 2017, M&A deals involving Cenovus Energy Inc. as either the acquirer or selling party have accounted for half of all upstream deal activity in Canada between January and October. The company has dominated the M&A landscape in Canada this year and October was no different. The new CanOils report – available to download here – analyses every Canadian upstream deal in October and focuses on Cenovus’s sale of its Palliser area assets to Torxen Energy and Schlumberger. At C$1.3 billion, this deal accounted for 81 per cent of the total C$1.6 billion M&A spend in the Canadian upstream sector in October. In total, Cenovus has now been involved, as either the acquirer or selling party, in around C$20.5 billion of Canadian upstream deals this year up to the end of October. That equates to half of the entire upstream M&A spend in Canada in the same timeframe. If we exclude deals in the Canadian oilsands sector, non-oilsands deals involving Cenovus in either a buying or selling capacity make up 32 per cent of non-oilsands deals in Canada, again, up to the end of October. By the end of November, these percentages will undoubtedly increase, given the company’s most recent agreement with Whitecap Resources to part with its Weyburn unit in Saskatchewan for C$940 million. Away from Cenovus, October did see a number of other significant deals complete. Hong Kong’s MIE Holdings Corp. completed its acquisition of the CQ Energy Canada Partnership for C$722 million; RMP Energy Inc. completed the sale of a large portion of its producing asset base on its way to becoming Iron Bridge Resources Inc. in the near future; and Crescent Point Energy revealed a set of noncore asset sales for a combined C$190 million in its third quarter results release. Over 14,500 boe/d was also put up for sale in public asset listings. Evaluate Energy’s latest M&A report shows that the third quarter witnessed $41.7 billion of new upstream oil and gas M&A deals. This is a 50% increase in total spending compared to Q2 2017 and it is also just above the average quarterly spend of $39.8 billion since the oil price downturn began in late 2014. Download the full report here. 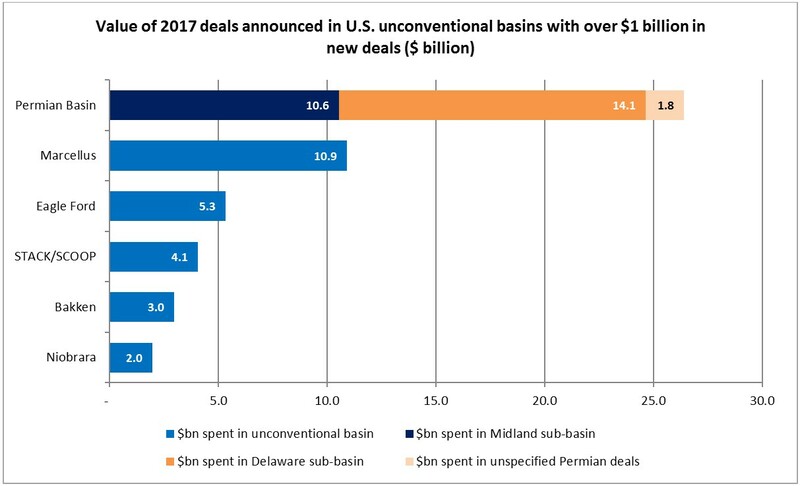 Meanwhile, in the U.S., the Permian Basin still dominates U.S. activity in 2017 despite a second consecutive quiet quarter of deals, in which the STACK formation and Williston Basin saw the country’s biggest deals. For analysis on all the major deals this quarter, download the Evaluate Energy Q3 2017 upstream M&A review here. 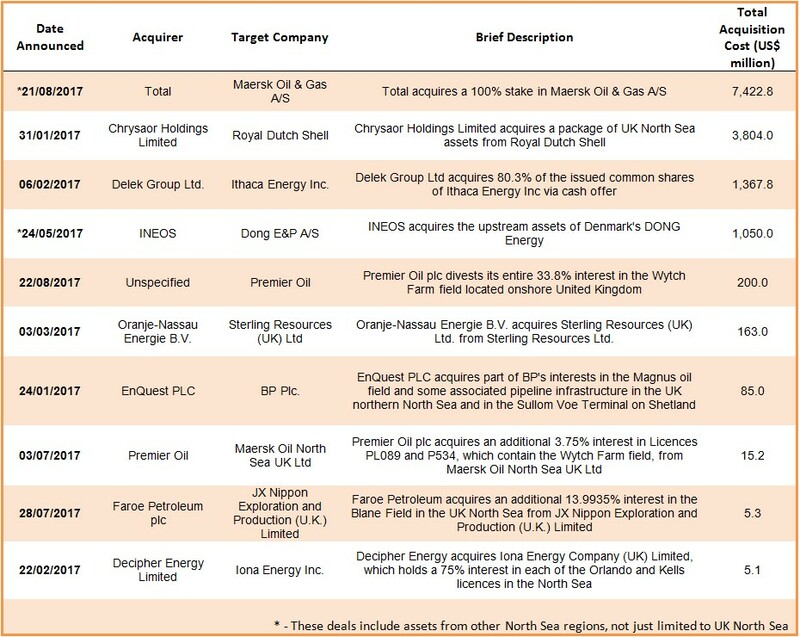 Around US$6 billion in M&A activity involving UK oil and gas companies has taken place during the first half of 2017 – with more activity predicted for the remainder of the year and into 2018. Total’s recent deal to acquire Maersk Oil & Gas A/S heads the list of deals involving North Sea assets this year, according to Evaluate Energy M&A data. Assets changing hands and the increasing diversity in their ownership suggests that the UK Continental Shelf may start to benefit from a badly needed investment boost, according to the findings of an annual economic report authored by Oil & Gas UK. The report says low levels of exploration and appraisal activity remain a serious concern with drilling at record lows. Oil & Gas UK said the basin needs further capital investment, as only three new field approvals have been sanctioned since the start of 2016. Click here to learn more about EE’s database of M&A deals.